The linuxwacom X11 driver now also provides touch support. It's realised as a new input device with option "Type" "touch". 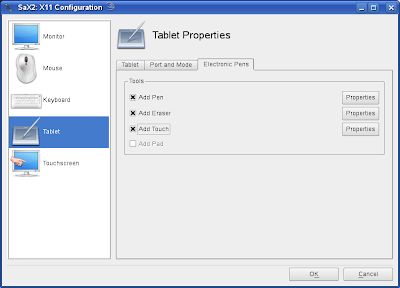 These devices work only on TabletPCs and with the option "ForceDevice" "ISDV4". Since SaX2 currently only supports the configuration of the Stylus (Pen) and the Eraser devices I had to extend Sax2 to allow also the configuration of Touch devices. You can find my patch here and an updated SaX2 package (for openSUSE >= 10.2) in my openSUSE Build Service home repo (you need also the latest x11-input-wacom packages from there to get the full support). If you have an other TabletPC with Wacom Multitouch support feel free to send me an email with your xorg.conf and some information about the machine and I add the machine to SaX2, so that you be able to configure your machine very easily.